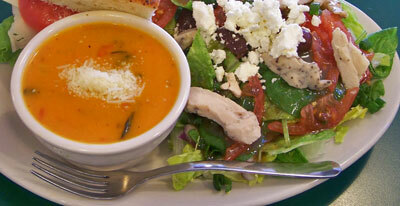 Fabulous Taste and Healthful Ingredients are the essence of our Sandwiches, Salads and Soups. 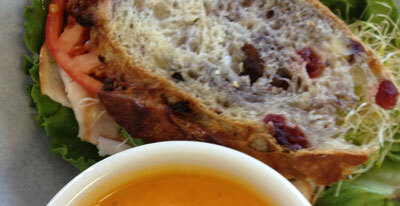 Our Signature Sandwiches and Soups are served with our Fresh Artisan Breads which we bake throughout the day. We use only fresh (local when possible) natural ingredients in all of our crafted products. Croissant with Smoked Turkey, Lettuce, Tomato, Avocado, Bacon and Mayo. Au Levain Bread with Bacon, Lettuce, Tomato and Mayo. Multigrain Bread with Cheddar, Avocado, Artichoke Hearts, Lettuce, Tomato, Mayo and Mustard. Croissant with Albacore Tuna, Green Onions, Lettuce and Tomato. Cranberry/Walnut Bread with Turkey, Avocado, Lettuce, Cranberry Sauce, Tomato and Mayo. We use homemade cranberry jalapeno jam! Toasted Sesame Bread w/turkey, lettuce, tomato, avocado, red onion, sesame mayo dressing. With Smoked Turkey, Bacon, Cheddar, Tomato, and Spicy Chipotle Sauce. Grilled on Au Levain Sourdough. Pulled Chicken, Mozzarella, Spinach, Tomato, Basil, Capers and our own Pesto Mayo on Ciabatta Bread. Seasoned Pork, Mozzarella, Red Onion, Cilantro, and our own Spicy Cuban Sauce on Au Levain Bread. Smoked Turkey, Spinach, Tomatoes, Red Onion, Asiago/Parmesan Cheese, and Spinach Artichoke Cream Cheese on our Au Levain Bread. Choice of Provolone, pepperjack, mozzarella, swiss or cheddar. 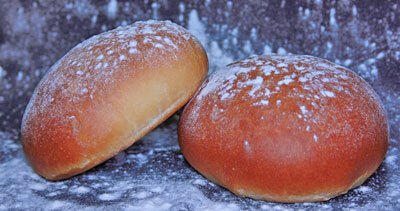 Can be prepared on any of our fresh artisan bread options. Your Choice of Bagel with Eggs and Green Onion. Add Swiss, Cheddar, Mozzarella, Ham, Bacon or Sausage. 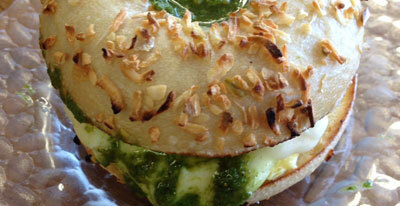 Your Choice of Bagel with Pesto, Tomatoes, Basil, Mozarella, Scrambled Eggs. Bagel of your Choice with melted Provolone and Cheddar Cheese. Parmesan Bagel with Smoked Turkey, Cream Cheese, Jalapeno, Lettuce and Tomato. Multigrain Bagel with Garlic Herb and Spinach Artichoke Cream Cheese, Tomato topped with melted Swiss. Albacore Tuna, Waldorf Chicken or Egg Salad. on the bagel of your choice. The Traditional, w/ Cream Cheese, Lox, Capers, Tomato, & Red Onion. Smoked Whitefish & Baked Salmon Salad on your choice of bagel w/Red Onion, Tomato and Capers (sub Wasabi Flying Fish Roe + $2.00). We Make Delicious Vegetarian and Meaty Soups Daily. Enjoy a Bowl or Cup with Our Own Freshly Baked Breads! Add a Cup of Soup to any Sandwich. All salads come with two slices of Rosemary Ciabatta Bread. Caesar Salad – The Classic!